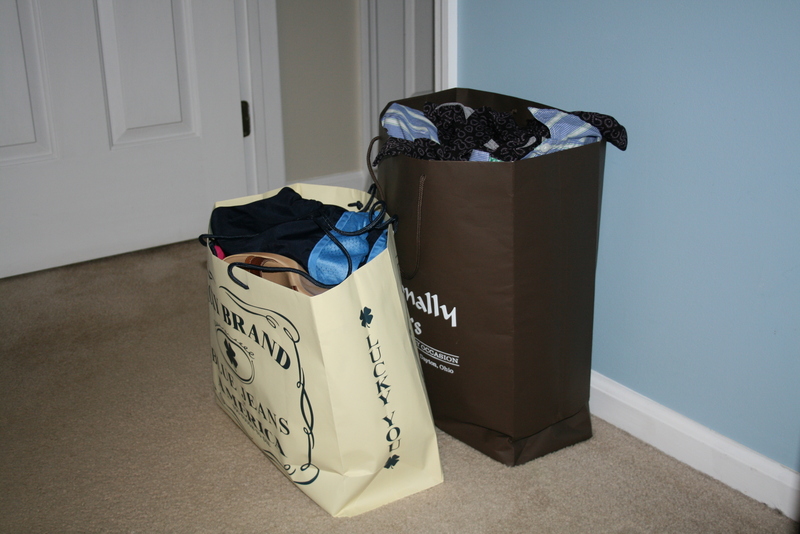 I cleaned out my closet last night. And my dresser for that matter. I love cleaning things out. There is just something about de-cluttering something, anything, that brings me great joy. It’s is so cathartic it isn’t even funny. If I ever slip into depression, all you’ll need to do is hook me up with a hoarder and tell me to go to town. 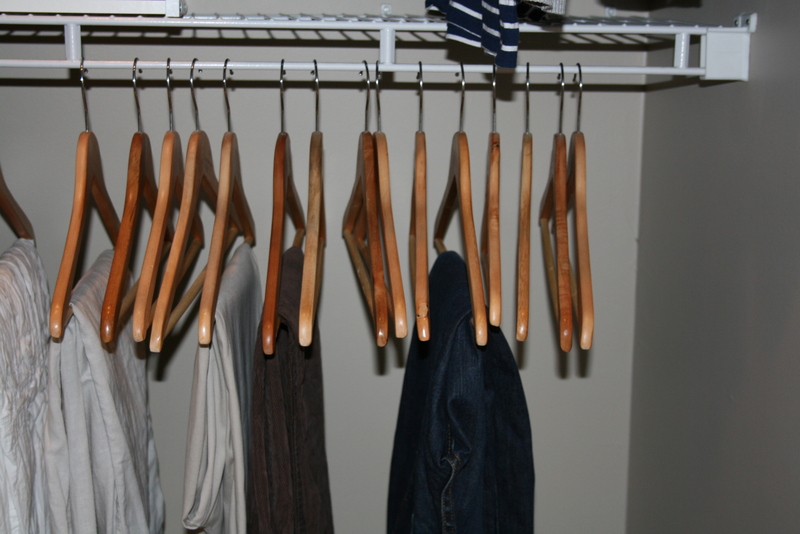 All of those hangers had had jeans or other pants on them. They don’t fit anymore! (And to be honest, the three in the middle you see hanging here are too big, but not falling off yet.) 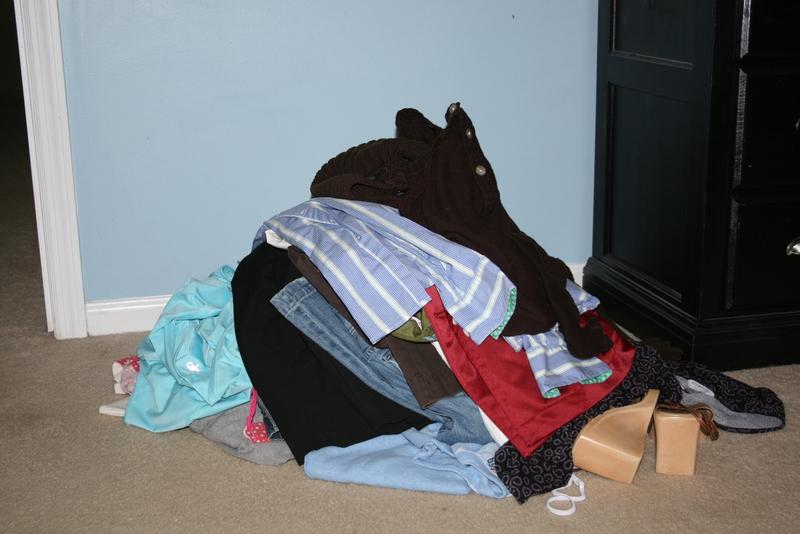 I packed away the best of them (for, God-willing, I gain the good kind of weight that begins to come off 9 months later…) and will donate the rest to Goodwill. I found some great Gap and Nine & Co. jeans and pants yesterday there, so I’ve been able to re-populate some of my closet with size 8’s–HOORAY! *A moment about Goodwill: Before you write it off and think you’d never shop there…give it a chance. Obviously, some Goodwills are better than others, but you never know what you’ll find. I have a friend who has gotten multiple pairs of Lucky jeans for herself and her family, and there are tons of Gap, Banana Republic and J.Crew gems out there just waiting to be discovered. The trick is to go often (up to a couple time a week) and get to know your store. Once you know where your size is in all the sections, it doesn’t take long to buzz in and see what treasures are waiting. You would not believe what some people give away, with the tags still on them! Posted on May 6, 2011 March 1, 2016 by thehealthypineapplePosted in Slice of LifeTagged cleaning, closet, clothes, goodwill. I can feel your joy of cleaning and organizing seeping through my very sleepy veins this morning. Nothing like a good clean up and out to lift the spirits!